Congratulations on choosing alternative medicine/integrative medicine as your natural, most reliable path to good health. We think you will be satisfied with the results and the genuine, down-to-earth approach we take with our patients. Please plan at least an hour for your first visit. First time appointments must be in person. 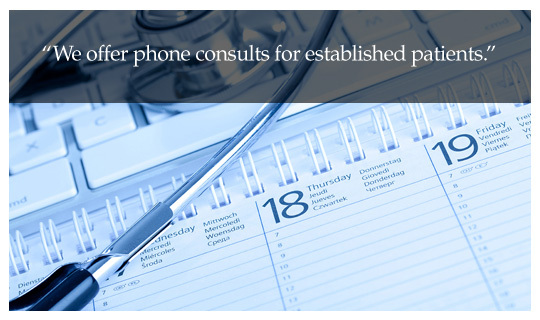 Please note that after your initial visit, Pennsylvania resident patients may renew their bio-identical hormone replacement prescriptions and thyroid replacement medications via phone consultation. Our website is available to place orders which include RX refills with a valid prescription from family medicine Dr. Adrian J. Hohenwarter. All new and established patients are expected to schedule follow-up appointments to discuss the progress of their treatment plan. Phone calls and emails are not a substitute for this. Annual follow up appointments are required for prescriptions and every 6 months for testosterone. Please note we cannot treat patients who do not live in Pennsylvania. Emails pertaining to the diagnosis and treatment of medical conditions will not be addressed outside an office appointment. Emails will not be read due to the large volume of emails. Diagnosis and treatment of medical issues cannot be addressed via email or messages and questions left with scheduling staff. Our family medical doctor in Palmyra services patients from various locations such as Annville, Chambersburg, Hummelstown, Harrisburg, Hershey, Lancaster, Lebanon, York, Elizabethtown and Reading, PA.